STRC has new 17mm Wheel Hex Adapter (Part#ST1654-17) for the Traxxas Slash 4x4, Stampede 4x4, and Rally car. The 17mm Wheel Hexes are available in four colors: Blue, Gun Metal, Red, and Silver. Having this adapter allows people to put on high traction 1/8th scale buggy tires on the Slash 4x4 or Stampede 4x4, or put on GT-8 Slicks/Rally tires on your new Traxxas Rally with the 17mm hex adapter conversion kit. 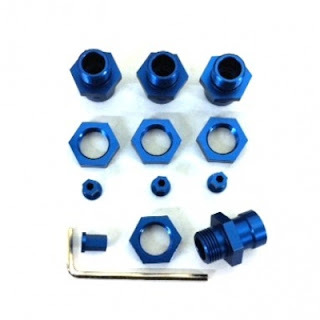 Features a simple single nut hold-down setup at each axle, these 17mm hex adapter opens up a huge range of tire selection and styles for the Traxxas vehicle.